One of the most complete - and easy to read - beginning guitar methods we've ever seen. The author is a classical guitarist with over twenty years experience teaching, but this method is for anyone regardless of what style of music you want to play. Introduces the 3 gateways to learning guitar: note-reading, chords and tablature, with just enough fretboard and music theory to help, but not overwhelm. 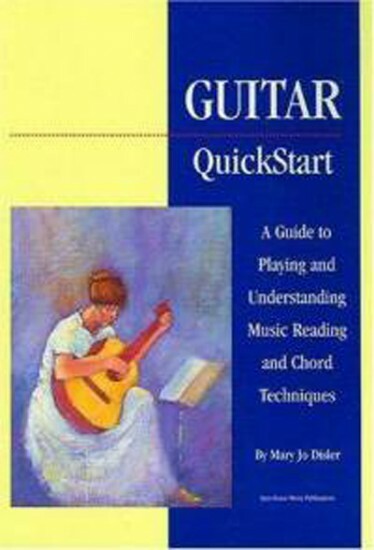 Uses a straight-ahead approach that combines "how to play" instruction with basic info, tablature and workbook material to give you a thorough understanding of the basics. From here you can more easily move to method books in the style you want to learn. Excellent for beginning classes, private instruction or self-study, for ages 10 and up. Recommended! 90 pp. Manufactured by: Lyra House Music Pub.